This month was awesome. Get rid of 7 things a day…..which basically meant getting to a total of 210 items by the end of April. In previous months I gave up something that I fully intended to get back when the month was over, but this month I was giving things away forever. Giving stuff away can be hard…..especially for the sentimental strong attacher like me. But when I was getting rid of things I began to see the reality of what I’ve been saying about being rich. I have so. much. stuff. For example, I went through my closet and tried to get rid of clothes I hadn’t worn at all for the past year. 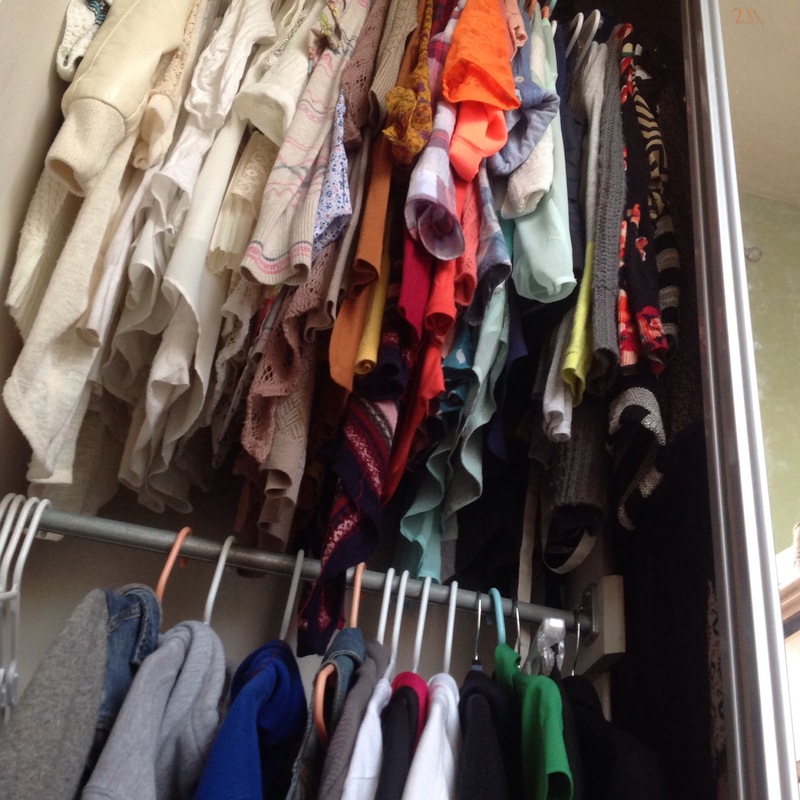 (I have this system of putting all my clothes in my closet with the hangers backwards, then as I wear things and hang them back up I return them to the closet facing the normal way. After a season I’m supposed to get rid of what I haven’t worn.) So I started there and got rid of things I hadn’t worn or things I just didn’t really like all that much. It ended up totally about 40 items in my giveaway pile. Yikes! I had a long way to go! So then I went BACK through the same closet and told myself, this time I was serious…my rule was I was not allowed to keep anything if I said “Well, I might wear that,” or “I wore this once last year.” I mean seriously…..do I need to keep clothes I wear once a year?? That’s outrageous. And after wearing 7 articles of clothing for a month and no one noticing, I don’t need a shirt for every day of the year. I tend to be drawn to my favorite things over and over again because they are my favorite to wear anyways. I also chose to keep only clothes that I felt great in. I figured its better to have a smaller selection of clothes I love and feel great when I wear them, than a stuffed closet with some clothes that just look ok on me or are uncomfortable. And to be honest, after the clothes portion of my purging, I still have 81 shirts hanging in my closet. That’s not including dresses or the clothes in my dressers. Obviously I had an abundance that I didn’t need. I feel like this month became less of me giving things up, and more of cutting out unneeded excess. I think about how Jesus lived His life; He is after all, my example. He did not own a house, or have a permanent place of residence. My friend Lindsay and I were talking and she had been thinking about how Jesus probably had one tunic. One! Instead, His life was filled with people and purpose. He was all about doing the will of His Father and communicating His gospel message with the world. Now don’t worry, my goal is not to become a hippie girl who shows up on your doorstep wearing the one dress I own and ask if I can sleep on your back porch…..as Lindsay says “We’re shooting for normal here.” But I do want to have the same mindset as Jesus. To see the things of this word as what they truly are: temporary. To become a person who is generous. A person who does not hoard things and fill every nook and cranny of her house. A person who is about loving Jesus and loving people. A person who is about experiencing the gospel and carrying its message to others. And the best part of this month?? SPACE!! Seriously. When I began to get rid of things, I was amazed at how many less things I had to pick up off my floor. Everything had a spot! No more shoving shirts in drawers and cramming them shut. No more piling shoes on top of each other in the bottom of my closet. And guess what…..it feels great! I imagine that’s how our lives can be as well. Are we too full with the things of this world that we don’t have space to hear from and spend time with Jesus? Are our hearts so full of our own agendas that we rarely ever give thought to the One who created and loves us immeasurably? I suppose I’ll process that more in June for my month of rest. 🙂 For now, here are some practical take aways…..or shall I say, challenges for you…..read at your own risk of feeling conviction…. 1. Give away 210 (or 217) items in a month! 2. Choose the smaller space if applicable! For example, if you’re moving into a house/apartment with several people, choose the smallest room. A smaller space can help you keep minimal things. 4. Count how many things you have hanging in your closet. And be changed. 6. If you’re friends with me, or even just in general, try buying consumable gifts. I love getting flowers, pretty blank cards, gift cards, great smelling soap, and other creative consumables. One, because they are fun, and two, because they will be used up! If you feel the Lord convicting your heart to take up one of these challenges, I’d love to hear from you!